The Premier Parade 600mm Floor Standing Bathroom Vanity Unit and Basin has been manufactured with the finest materials and finished in a stunning high gloss white finish it is sure to compliment the rest of your bathroom perfectly! 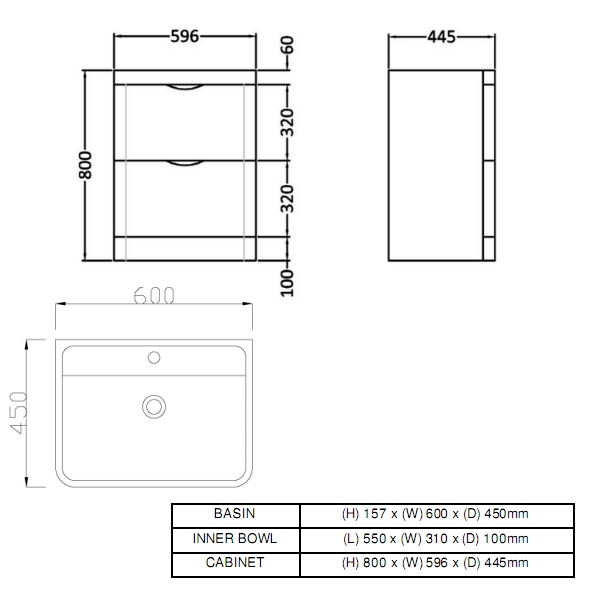 *Please note that basin tap is not included and must be purchased separately - see product options for further details. The Premier Parade 600mm Floor Standing Bathroom Vanity Unit and Basin is covered with a 5 year guarantee. Giving you that peace of mind when purchasing a Premier product. The Premier Parade 600mm Floor Standing Bathroom Vanity Unit and Basin has been designed with a stunning high gloss white finish, transforming your bathrooms design making it a truly eye catching piece. For your convenience the Premier Parade 600mm Floor Standing Bathroom Vanity Unit and Basin comes with a modern polymarble basin. Basin tap is not included. This vanity unit has been designed to be a soft closing unit, meaning a simple push of the drawer will then slowly bring it back to the original resting position, a real attention grabbing feature. Q: what is the basin made of? Is it ceramic or resin or?? ?